09-Apr-2016 -- This is the first out of four reports reaching confluence points in Southern France. Friday after work at 3:24 PM I took the TGV Lyria from Zurich to Paris arriving there at 7:30 PM. I had to change the train station from Paris-Gare de Lyon to Paris-Austerlitz to catch the night train to the famous pilgrimage town Lourdes in south of France, about 15 km north of this confluence point. After my arrival in Lourdes at 6:28 AM, I first had a huge breakfast buffet in one of those 270 hotels. As usual, I had brought my bicycle with me, such that I could directly cycle towards this confluence point. With the height difference between Lourdes and 43°N 0°EW being 1000 m, the road soon started climbing. The last tiny village before reaching the confluence is called Ourdon at 800 m altitude. From the village a forest track zigzags upwards and winds a couple kilometres at 1200 m altitude through the conifer forests. Unfortunately, the track was still snow covered such that cycling was a big challenge. The track reaches the minimal distance to the confluence at 200 m. But at this location, the grade is too steep to attempt a climb. So I continued the track until I reached a hut on an open meadow (630 m distance from the CP). I put my bike in the cosy hut and started my way to the confluence on foot. This turned out to be a dangerous and exhausting hike that I would not recommend at all. 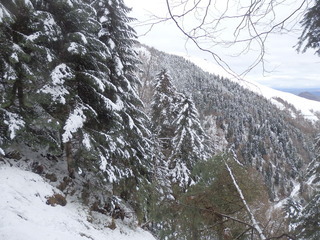 Due to the snow and the steepness of the terrain, I could easily slide down involuntarily. The mixture of soil and snow was extremely slippery, and the gradient of the terrain became steeper and steeper as I approached the confluence. About 70 m to the confluence I was ready to give up. The incline had become dangerously steep, I had to pull myself upwards from tree to tree. I returned exactly the way I had come, following my footsteps. This way I could be sure to handle the gradient even though the way was three times longer than the direct beeline to the track. Cycling back to Ourdon was also much easier, not only because it was now going down, but also because the snow on the track had melted away significantly. After having a Ski Lankan lunch in Lourdes, I visited the Sanctuary of Our Lady. The story continues at 43°N 1°W.